"This award further validates our continued research efforts aimed at improving comfort, safety and performance, which are at the core of our corporate mission," says Argo Tractors marketing director Antonio Salvaterra. The Landini Advanced Driving System aims to enhance operator comfort by making it easier to control and manage operations. The technology allows the operator to concentrate on row operations, while the tractor ECU takes care of driving, recording hours of operation, consumption and service requirements thanks to the IoT service, a world première in specialty tractors. 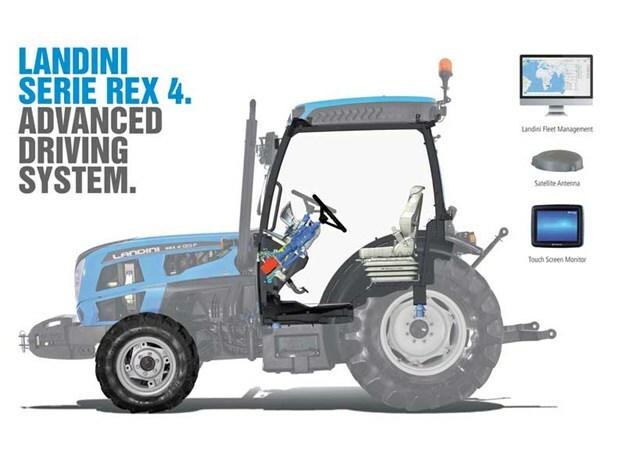 The Landini REX 4 is equipped with an innovative hybrid driver assist system that uses cutting-edge mechatronic technologies to assist operators in manoeuvring both in field and on road. Using the same principle adopted in cars, wheels to return to the central position automatically after a turn. This new technology solution also offers connection to satellite guidance, memorisation and control of wheel position during slope and in-furrow operation, and offsets the effects of external stresses on tractor steering accuracy. In addition, the operator can manage the functions of the machinery from a single terminal, as the monitor configuration automatically changes according to the functions used.